The Compline ChoirKING FM 98.1 - Classic Radio Inc. | KING FM 98.1 - Classic Radio Inc.
Also known as the “chant service,” Compline is an ancient nighttime prayer, sung by the Compline Choir. A Seattle tradition since 1956, and broadcast live since 1962 on Classical 98.1 KING-FM. 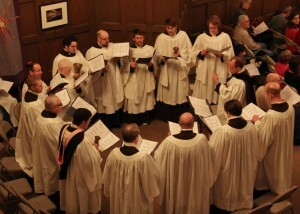 Compline is sung every Sunday night at 9:30 p.m. Pacific Time at Saint Mark’s Episcopal Cathedral in Seattle, Washington.